Leapin' Lava Meltdown is the special level of World 6 found in Yoshi's New Island, as well as the final normal level in the game. Yoshi starts the level in a castle where he has to throw a Metal Eggdozer to activate a red ! Switch. As soon as Yoshi presses the switch, he will have to run across ledges entirely made out of red blocks that disappear after a short amount of time. Yoshi has to press more ! Switches in order to advance through the blocks. Once Yoshi gets to the end of the blocks, he will have to throw a Mega Eggdozer upwards to make a door appear in front of him. The door takes Yoshi to another section with rising lava, and moving platforms. 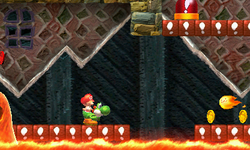 Yoshi has to use the moving platforms to escape the rising lava. After Yoshi escapes the lava, he'll see the Goal Ring at the end of the level. This page was last edited on April 15, 2019, at 12:14.